The laptop/tablet hybrid gets a host of new improvements. Microsoft knew it was taking a gamble with the hybrid interface in Windows 8. The Surface showcased the dual-desktop idea, and even experimented around with the low-power ARM processor. For whatever reason, the Surface never really caught on, forcing Microsoft to heavily slash prices to start moving inventory. Regardless, it's moving forward with a new and improved version of the Surface, hoping that with better battery life, a new kickstand, and more power, the hybrid device will finally find a market. The Surface 2 gets a moderate improvement in battery life, with Microsoft quoting 10 hours of "active use", even with the new 1080p screen. Both cameras get a boost, with the front-facing camera modified to perform better while video chatting in low-light environments. Also, the kickstand can be adjusted for lower angles, so it's more comfortable while being used on a lap. Perhaps the most important change is that Outlook will now run on the ARM-based tablet, meaning it now has a shot at adoption in the business world. 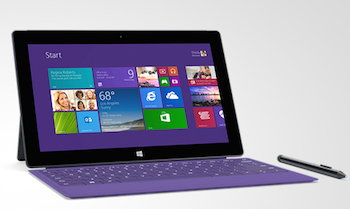 The Surface Pro sees fewer, but more critical, changes. The 1.6Ghz i5 processor running with Intel's new Haswell chipset earns a 60% increase in battery life along with the improved performance. Microsoft has yet to announce any specific hours to go with that battery life, but any improvement over the original's notoriously short lifespan would be welcomed. The solid-state storage can be customized to be anywhere from 64GB to 512GB, but specific pricing hasn't been announced yet. The Surface starts at $449, and the Surface Pro at $899. Neither price includes the (now backlit) $119 Touch Cover 2. Meanwhile, purchasing either device will earn you 200GB Skydrive storage and one year of unlimited Skype calls to landlines. Pre-orders are set to begin shortly.